LOVE the lime addition! Such a great flavor combo! Thanks Susie! It gives it a little ZING! YUM! These look so good and I love anything with just 4 ingreidents! I've never put lime juice in anything with dates, but I'm the world's biggest fan of the lime/coconut combo so I know I'll love it! I must add that cashews are my favorite nut so yes, this was made for me! I hope you'll try them! thanks for these! i love something easy but that has a great taste to it. i need to pick up some dates, but i've got everything else! 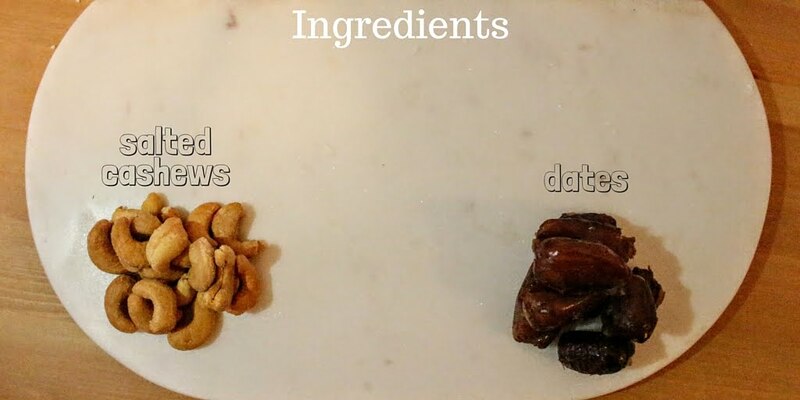 I love dates but have never actually tried making anything with them myself. I never turn them down when they're being served wrapped in bacon or stuffed in cheese...or both! I'm sure that's not Whole 30 friendly, but these sound tasty and and healthy! Can you believe I've never had one before the Whole30? Now I'm obsessed! I might have to try them wrapped in prosciutto or something for a compliant appetizer..thanks for the suggestions! Omg, lime is such a good idea!! I love lime anything. Oh no!! I use mine so much so I hope it doesn't break on me! I've never had dates before (woops) but these look so good! I love Luna Bars and recently have been liking Lara bars too! Yummm I love both dates and cashews! These look great for packable snacks for running or hiking. YESSS!! 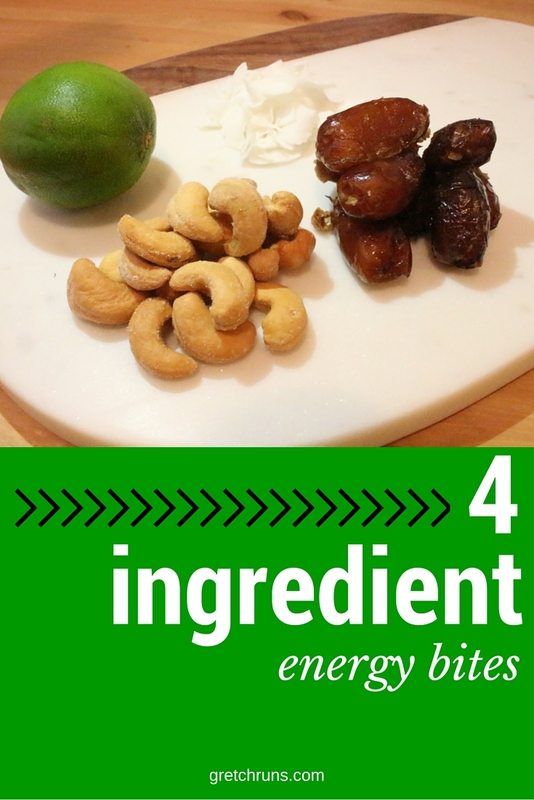 I never think to add lime to my energy bites - that has to change!! I used to LOVE Luna bars, the chocolate coconut was my go-to snack before going to Zumba, but they started giving me terrible stomach cramps! once so bad, that I couldn't stay in zumba. Now my go to snack is a multigrain bagel with hazelnut cream cheese. It's much easier on my stomach. Will have to give this recipe a try! Oh no! That's too bad. Your bagel sounds amazing! love this! i like luna bars sometimes, but they aren't filling enough to justify the cost, though i love the small ingredients list. i've made something similar to this before - dates, coconut flakes and peanut butter i think. they lasted less than 24 hours... KC loves PB haha. That sounds so great :) Dan doesn't really like chunky stuff like this so he won't eat them luckily! Lime?!?! Oh girl, I am all in with these energy bites! 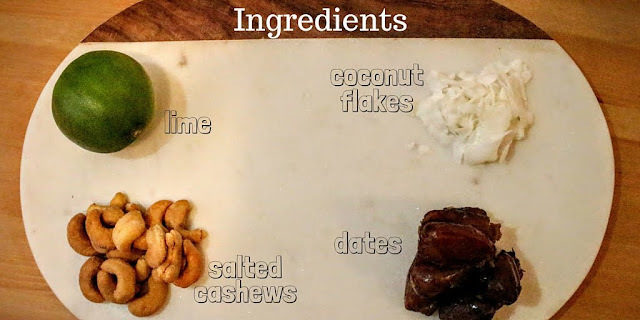 I just started adding dates into my energy balls and I totally love them in my energy bites now. Put the lime in the coconut and...eat it all up :) GREAT first recipe!! So simple, yet delicious. Yay!! Congrats on your first recipe! :) This sounds DELICIOUS, and I love that you added lime and coconut to it! Great salty sweet combo, sounds simply delicious! I have an unhealthy addiction to Luna's. I should try this recipe!